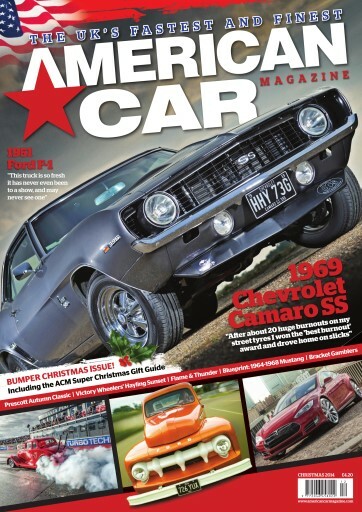 It's beginning to look a lot like Christmas – whether that's a good thing or not is up to you – and especially in American Car Magazine. Hogging the cover we have a '69 Camaro SS sporting a big block and a bad attitude. Inside there's a '51 Ford pick-up built for cruising the waterfront. Then there's the ever-useful ACM Christmas gift-guide, a free, massive 2015 wallplanner, a report hot from the NEC Classic Motor Show, a catch-up on all the late-season shows and end-of-season race meets, and so much more, plus competitions to win prizes from a model Pontiac to a full suspension makeover from Eibach. So gather your winter fuel, deck your halls and all that tripe, and make sure you don't miss the Christmas issue of American Car Magazine, out now.